The Crochet Challenge Kicks off Friday, January 27, 2018 (at midnight EST) and ends February 24, 2018. I’ve teamed up with my friends at Yarnspirations to bring you our third Crochet Challenge for Warm Up America! Are you ready to make a real impact on someone’s life? You’ve seen me tease this big event on my social pages for a couple weeks now and I know you’re bursting at the seams to get started. Well friends, it’s almost time to begin and this page will give you ALL of the information you need to prepare (in one convenient place). The Challenge is open worldwide to anyone who wants to make a real impact in someone’s life. Each participant will complete the gorgeous afghan teased above (in the color palette of your choice) and will donate it to the Warm Up America! Foundation, a sister organization to the Craft Yarn Council. This year, Warm Up America! Foundation will donate our challenge lapghans to the courageous hearts at Morehead State University in Kentucky to pair with a bed built in the Build-A-Bed program. Build-A-Bed targets an often neglected community, children of the working poor in Kentucky who are living in homes with not enough beds, or none at all. Since 2009, Morehead State University has teamed up with AmeriCorps volunteers to build hundreds of twin beds. Along with the beds, they provide complete new bedding and a bedtime bag that includes a pillow, afghan (that’s where Warm Up America! comes in) nightlight, hygiene kit, stuffed animal, books and more. And by participating in this crochet challenge, you will play an important role in accomplishing this goal. Warm Up America! Foundation was founded by a courageous yarn hero named Evie, back in 1982. When her mission surpassed the span of her home, the Craft Yarn Council stepped in to lend a helping hand. I encourage you to read an earlier blog post about Warm Up America! Foundation. They are simply an incredible organization! The challenge is exactly 13 days away. I want you to have plenty of time to prepare before the challenge begins. Here’s everything you need to know right now. The challenge will begin on January 27, 2018 at midnight. On that date, all information including written pattern, video tutorial and diagram will be posted here at B.hooked Crochet. The challenge will end on February 24, 2018. Your lapghan must be postmarked (scanned at the post office) by Saturday, February 24, 2018 to complete the challenge. I personally found the color options limited at my local store. It never hurts to check next time you’re out but I would plan on ordering your yarn online so you can choose any of the One Pound colors (not just what the store has in stock). I purchased my yarn from Amazon and recommend this option because stock is plentiful and shipping is cheap or free for Prime members. Disclosure: Please note that the links below are affiliate links, and at no additional cost to you, I will earn a small commission if you decide to purchase your supplies through these links. Please understand that I have experience with these products and I recommend them because they are optimal for this pattern, not because of the small commissions I make if you decide to buy them online. If you have received valuable information from me at any point, this is one easy way to say thank you for a job well done. Thank you! 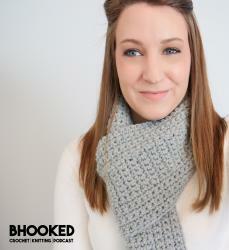 Get a 30% discount by entering BHOOKEDONEPOUND at checkout! ENTRIES ARE NOW CLOSED FOR THIS GIVEAWAY. CONGRATS TO MONIQUE C., ANASTACIA G., DENISSE S., KELLY P. AND ANDREA L. FOR WINNING THE YARN TO COMPLETE THE CHALLENGE! Yarnspirations is giving the yarn needed to complete this project to FIVE lucky winners who sign up below! But act fast, the entries will close on January 21st! Entries are limited to US and Canada residents only. Five winners will be selected at random on January 22, 2018. The winner will be contacted via email and must reply with their shipping information within 48 hours of receiving it. If the winner does not respond within the given time, a new winner will be selected at random in their place – so be sure to check your email (and spam folder) on Monday! Fill out the form below to secure your entry for the Giveaway. 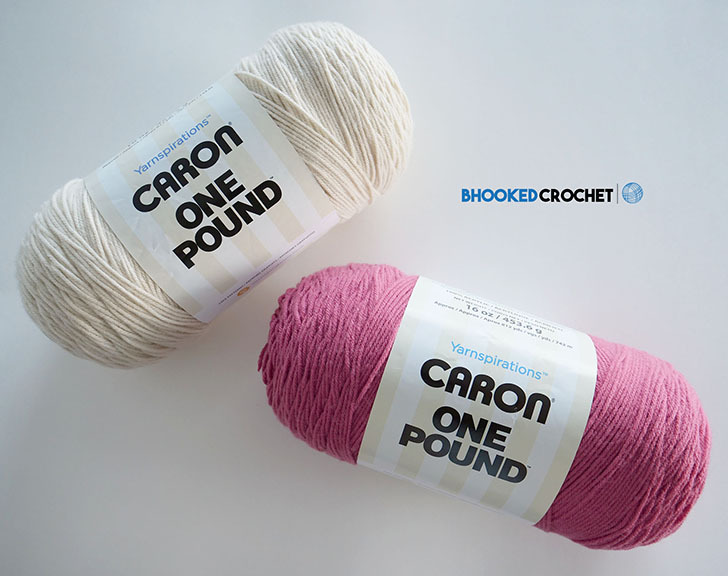 Caron One Pound is available in 39 different colorways for you to choose from and you can use whichever two you like! This is my favorite part of watching the challenge unfold – It’s amazing to see a single design transform when you use different colorways and if there’s one thing I learned from the first and second challenges, you guys are incredibly creative! The design works really well with colors that contrast, so pair a lighter shade with a darker shade to really make it pop. However, you’re not limited to what you see in my blanket! I also love the look of textured stitches with a single color – that’s totally possible here too! If you want to put the focus on the texture rather than the design, pick your favorite color and buy two balls of it. I can also imagine how this design would look with one of the variegated varieties of One Pound or two shades with less contrast – the sky is the limit here! This pattern will challenge your beginner skills or work up easily to a seasoned crocheter. You will be provided with a detailed video tutorial, diagram and written instructions to help you through this process. I’ll be the first to admit, last year’s design was tough to beat. However, I couldn’t be more pleased with the way this beauty turned out. Through this design, we focus most of our attention on the different textures and how each piece comes together to make one stunning throw. If you’re a beginner, don’t go running for the hills! I want to set each and every one of you up for success with this challenge. It’s the least I can do for your yarn hero efforts! A video tutorial will be posted on the 27th along with the written instruction and a diagram for those of you who are a little more advanced. If you’re not sure about the techniques and if you’re able to work them, hold off getting your supplies until after you watch the tutorial. When you see that you can handle it, quickly order your supplies and you’ll only be a couple days behind! Join the Crochet Challenge for WUA Facebook event page! This helps me keep track of the number of participants and gives you a place to share your progress photos, ask questions and connect with other yarn heroes. 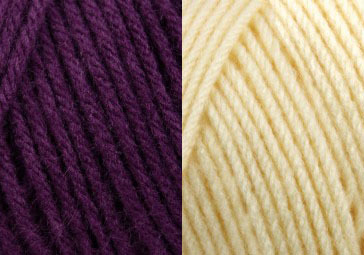 Decide what colorways you will be using for Caron One Pound. Visit www.bhookedcrochet.com/wuachallenge2018 on January 27th (midnight EST) and begin! This crochet challenge and the lapghan you will make from it means the world to Warm Up America! Foundation and the families who will receive your gift. I am so grateful to each and everyone of you who is willing and able to participate. What size are the hexes and the finished size? I think mine is going to be too big. Hi Leslie! My hexes measure 14″ from point to point. I hope it all goes well for you! Thank you. Looks like I’ll be starting over. Mine are 17. I’ll have the hex pattern memorized by the time i’m finished. Absolutely! That’s a really great idea and I’m sure it will give you a clean looking result! 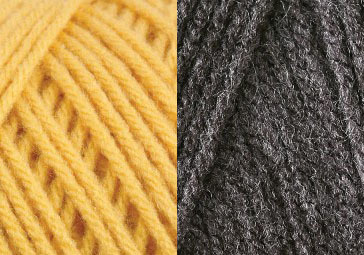 Which color uses the greatest portion of the skein? They’re pretty even but the white (color A) uses just a tad bit more. So I know you recommend one or two colors. But what would your opinion be to using three colors? I know that changes the yarn amount of each color. But visually, what is your opinion? Would it make it too “busy”? I’m toying with the idea of using two different shades of green but I want to use a blue too. Hi Lea! I’m so intrigued by the idea of using two shades of green! I don’t think it will be visually “busy” since they are in the same color family. You could use the two to create an ombre sort of effect. I can’t wait to see it!